H2O BFS is capable to provide the required product to control biofouling. The choice of product depends on local site specific conditions and specifications. Our WATER-TOP program will assist the client to make the correct choice of biofouling control product for their system. The required capacity of the generation system is tailored according our Ecodosing method. Guarantee on both the equipment AND on the efficiency of the biofouling treatment! Below are some of the products presented which H2O BFS can provide, this includes the engineering, dosing system and required chemicals. H2O provides Electrochlorination systems. The range of Electrolyzers are designed for low-maintenance Sodium Hypochlorite (NaOCl) production for on and offshore application. H2O can supply both concentric tube and parallel plate electrolyzer technology to form a range of systems to suit most applications. Additionally, they can also be supplied for non-hazardous and hazardous. The systems can be supplied for installation in both classified and unclassified areas installation. The are fully automated units manufactured to comply with clients unique specifications, applications, and globally recognized standards. Electrochlorination is the process of producing a non-hazardous chlorine equivalent by the electrolysis of a brine/seawater solution to form a sodium hypochlorite solution. Sodium hypochlorite is an industry-standard oxidizing agent for an extensive list of applications, from marine biofouling control to potable water disinfection. 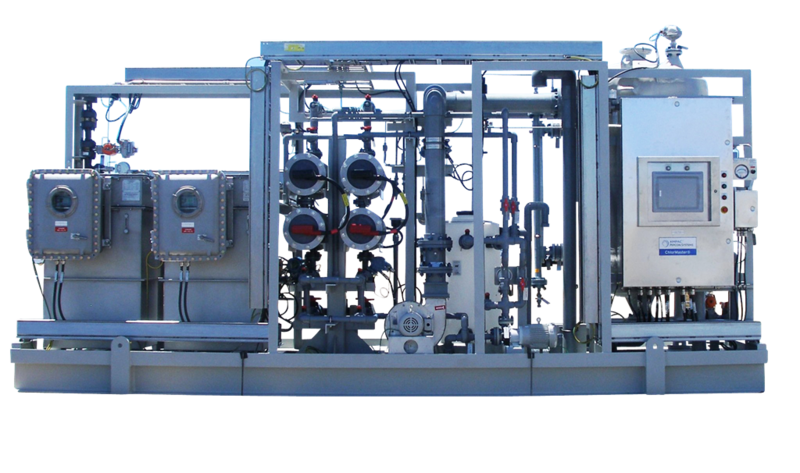 H2O provides brine based electrochlorination packages. A Brine System is the description given to an Electrochlorination Package that instead of using seawater for an electrolyte the electrolyte is manufactured on site from salt and town water utilities. Chlorine dioxide(ClO2) is a technology which has been historically applied at large scale (recirculation) cooling water systems. Additionally, chlorine dioxide generators are being increasingly used as an alternative to chlorine generators in water treatment/disinfection processes, as they release lower quantities of toxic impurities into the atmosphere as compared to conventional chlorine based generators and hence also require lower dosing numbers. Chlorine dioxide generates the product in situ which prevents storage of the product or risks of exposure to high concentration of the product, it has proven to be a safe technology. The unique patented product, the ‘Biobullet’, were developed by leading scientist at Cambridge University. The products are optimally engineered to remove costly biofoulers from industrial infrastructure, thereby increasing the efficiency and lifespan of industrial plants and their component parts. 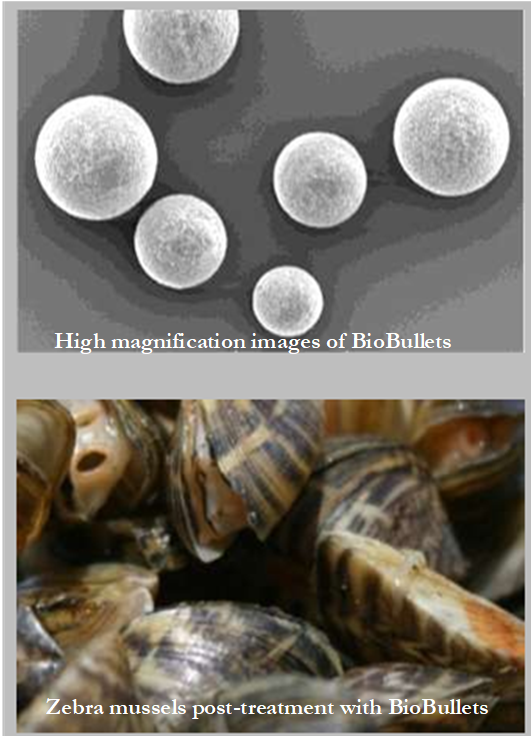 BioBullets’ products are effective against a range of nuisance pests including mussels, oysters, clams, tunicates, barnacles, bryozoans, hydrozoans and sponges. For mussel control, we estimate that encapsulation of the active facilitates use of 1000x less product than freely dosing. Encapsulation also facilitates use of environmentally friendly actives. H2O Biofouling Solutions B.V. is a BioBullets service partner. Contact us for more information.